We all know that moving your WordPress website to a new host can be difficult to most people. Of course, it can be a stressful experience, but with the right info, you can easily transfer your WordPress website. Most people have challenges especially when they’re planning to move to a new host or transfer their WordPress website. If you have any problem with your current host/provider, you can transfer your WordPress website to another host. In this article, we are going to discuss step by step ways on how you can transfer your WordPress website. The first step is to back up your website file. This is the very first step to get started to moving/transferring your WordPress website. You need to back up every aspect of your website. Before making any major change, this is the very first step. If you want to back up your site, there are several plugins out there that will help you execute that which is the most common way of doing a backup. I use a plugin called WP Clone and it works great. You can also use an FTP program such as FileZilla. You need to connect to the web and copy all files to a folder on your PC or laptop. This process is very simple. It requires few steps to complete. You just need to login to cPanel a/c of your web server and then open phpMyAdmin app, and then choose the database that contains your WordPress installation and then click on export tab which is right on the navigation menu. Before migrating to the new web host, you must create an environment for WordPress installation. This will be achieved by creating a database that allows you to import SQL data. After doing that, you need to login to the new web host with user credentials and connect to cPanel software. For you to create a database, it is very simple. Below are the steps. • The first step is to open MySQL database and then create a database bearing your website’s name. The fifth state is to import your database. In this step, you need to launch phpMyAdmin from cPanel software on the new server. You will then select new database, open and the import from navigation menu. Importing is simple, you just have to select Choose File button and go to SQL file that you previously exported. This is the 6th step. 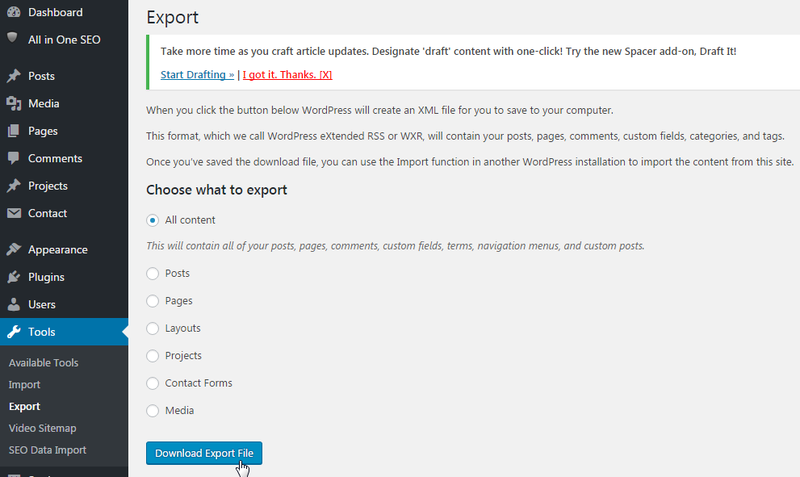 Hoping that you imported your database successfully, the next step is to upload your WordPress files to your new host. You will need to connect to your new host by using FTP program and then browse to the folder containing your website. Once you’re done with uploads, you don’t have to delete files from your PC/laptop. You still need then until the last step is done. What makes it difficult for most people when they’re transferring their WordPress website is that they have added the links to other posts on their website or added images by pointing to URL on the server. This causes them to break when they’re moved to new domain. If you want to know the easy way to search old domain name and replace, you can make use of Search Replace DB script on the github. This will make everything simple for you. Before using the site on the new we host, you must reconfigure your domain’s DNS setting. The process will depend on where your domains are registered. DNS changes take a maximum of 48 hours to fully/completely propagate. After the expiry period of 48 hours, you should access the new web host.